Will federal tax reform affect the size of the federal government? That’s one of the five tax reform questions tackled by economist Michael J. Boskin in an article in the latest issue of Economists’ Voice. Tax reforms that more closely tie the payment of taxes to expenditures will promote a more effective and efficient government… If everybody pays at a common rate, it will be harder to expand government and raise the rate, because a larger fraction of potential voters will have a stake in limiting the spending. 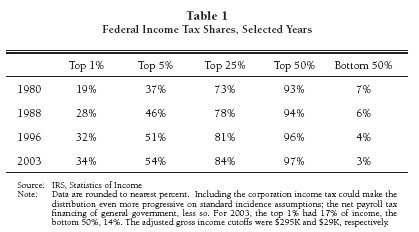 The more progressive the tax system becomes and the more concentrated among the few taxes become, the easier it is to expand government at the expense of a minority paying the bulk of costs. This was Milton Friedman’s most important insight when he first proposed a flat tax in Capitalism and Freedom. This is, of course, a point we’ve repeatedly made in our research on the number of Americans who pay zero federal income tax—a figure that’s estimated at 42.5 million in 2004 (see here for more on non-payers). This research is part of our Putting a Face on America’s Tax Returns project, which you can learn more about here.